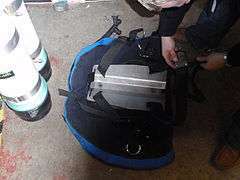 Steel backplates are commonly used when the buoyancy of the diver’s other equipment (primarily cylinders and exposure protection) would need a weightbelt, as the negative buoyancy of the steel plate can replace some of this weight. 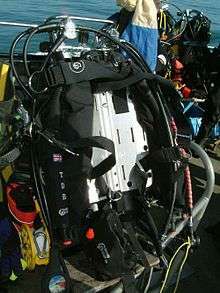 Aluminium backplates are commonly used when the diver would not require a weightbelt (such as when wearing heavy steel cylinders) or when the mass of the backplate must be kept low for air travel. 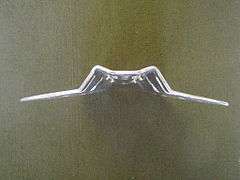 Backplates are occasionally made from other materials, including carbon fibers, titanium, and ABS plastic. 1 2 Jablonski, Jarrod (2006). "Details of DIR Equipment Configuration". 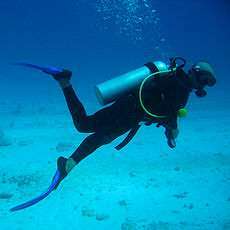 Doing it Right: The Fundamentals of Better Diving. High Springs, Florida: Global Underwater Explorers. ISBN 0-9713267-0-3.